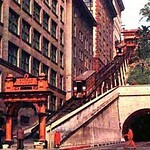 Angels Flight® is the only survivor from 19th to 20th turn-of-the-century development on Downtown Los Angeles’ Bunker Hill. The Railway is #4 on the list of more than 1,000 Los Angeles Historic-Cultural Monuments. As a traditional funicular inclined railway, Angels Flight® operates with minimal power because its two cars, Olivet and Sinai, are counterbalanced and are propelled by a cable rather than by any machinery in the cars themselves. On its first day of operation in 1901, more than 2,000 passengers rode Angels Flight®. It carried millions more before it was dismantled in 1969 to make way for redevelopment. The City Council’s mandate to reinstall Angels Flight® was realized in 1996 when it reopened after being rebuilt with all new machinery and with the original wood cars restored on new steel undercarriages.